How do people in Vilnius react to two guys holding hands? 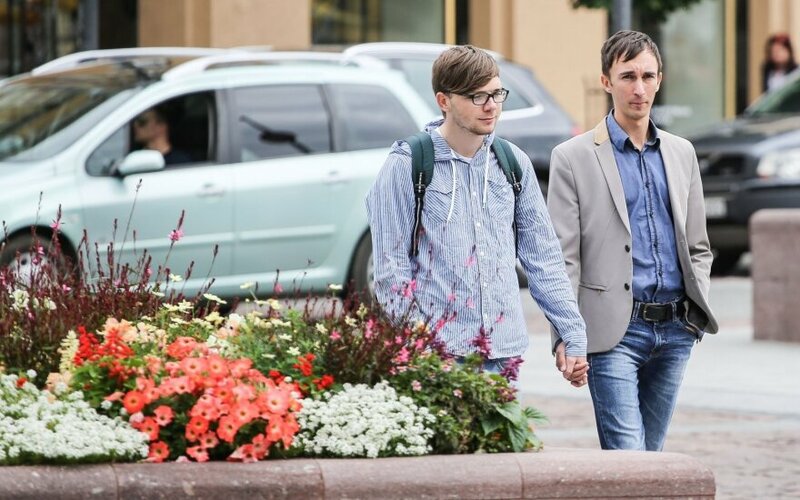 Two guys holding hands in Moscow and Kiev - participants of a recent social experiment aimed at testing Russians' and Ukrainians' attitudes towards gay people - have not been received kindly. DELFI has repeated the test in the capital of Lithuania. DELFI was inspired by a social experiment devised by "ChebuRussia TV" in central Moscow this July. Two guys holding hands in the Russian capital were met with much hostility: they were called names, bullied and almost physically assaulted. A similar experiment in Kiev returned even more sombre results: the two perceivably gay men were beaten up. Reactions in Vilnius, Lithuania, were somewhat different. The experiment was conducted by LGBT activist Artūras Rudomanskis, of the Tolerant Youth Association, and Donatas. 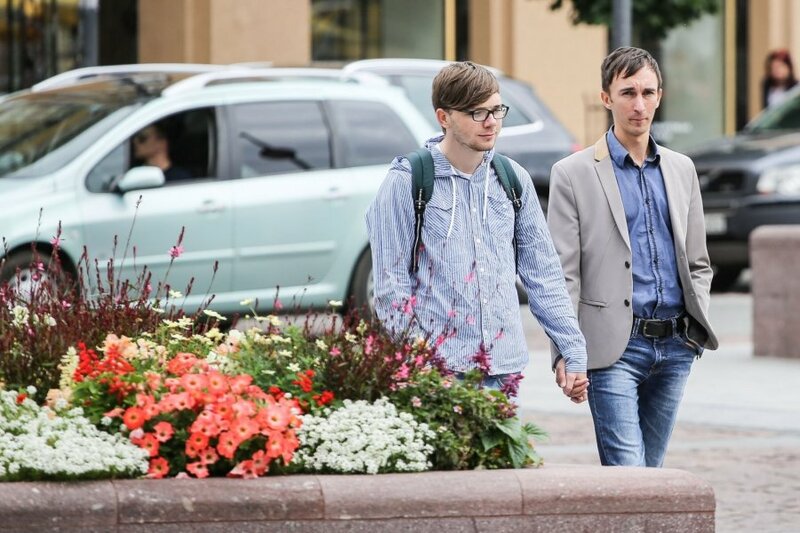 The two men, who are openly gay, started their walk on Thursday afternoon in the Cathedral Square of Vilnius. Smiling and holding hands, they proceeded along Pilies Street and Vokiečių Street, both busy with local people and tourists who seemed largely indifferent to the sight, throwing a curious glance at most. Artūras and Donatas then went to the quarter adjoining Vilnius Railway Station, a notoriously rougher and less touristy area of the city. Still, even here they did not provoke much reaction. One man approached them to ask for money in English - he probably assumed that only foreigners can be so defiant or ignorant of local attitudes towards homosexuality. Although a member of the European Union for over a decade, Lithuania has been underperforming in terms of LGBT rights. The “Rainbow Map 2015” released by pressure-group ILGA-Europe in May this year ranked Lithuania at number 36 out of 49 European countries in terms of safeguarding the fundamental human rights of LGBT people. The first EU-wide survey conducted by the EU Agency of Fundamental Rights in 2013 revealed that 61 percent of Lithuanian LGBT people who participated in the survey felt discriminated against or harassed in the last 12 months because of their sexual orientation. It was the highest percentage in the EU. "I expected there to be worse reactions. Mostly I saw confusion, people observing something unusual. Some smiled about it, others might have felt indignant, but those who saw us did notice," Rudomanskis commented after the experiment. "There were definitely reactions, I saw stern faces, especially if I caught their eyes." Rudomanskis admits he was bracing himself for significantly more negative reactions. Although there was no open aggression, he says he felt very tense throughout the experiment. He concludes that people in Vilnius are still not used to a sight of two men holding hands. Still, he was sure the reactions would be nothing like in Moscow or Kiev. "I though they might call us names, but I certainly did not expect any physical contact. One can definitely sense that we have been living in a democratic state for a longer time than people in Moscow or Kiev," Rudomanskis explains. He would not, however, venture to walk holding hands with his male partner every day - too much risk of finding oneself in a wrong place at a wrong time, he says. "I liked it. Pretty much what I had expected, there were stares, but I am happy that Lithuania is becoming more tolerant," his fellow experimenter Donatas says. He adds, however, that he would not dare to repeat the experiment on a daily basis with his partner in Vilnius.